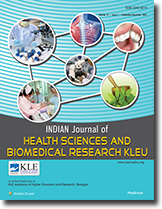 KLEU J.N Medical College Belagavi. Aligarh Muslim University, Aligarh - 202002, India. Christian Medical College, Ludhiana 141008, Punjab.